The British, regrettably, have an awkward relationship with Spanish charcuterie. We demonstrate a gulf of misunderstanding that matches that of our most notorious Torquay hotelier to his eager Spanish waiter, a relationship that played out on our screens at the time we adjusted to our new-found membership of the EEC. With the Eurozone now in (perpetual) crisis I think it is about time that we demonstrated a little more ‘communitaire’ understanding of our Iberian cousins, especially when it comes to their pork products. Why is it that we revere Italian “Prosciutto de Parma” ham, but not Jamon de Serrano and we mangle the pronunciation of their best sausages, even though we are consuming them in greater and greater quantities? It is estimated that over twenty per cent more chorizo was bought here last year but despite this we have not mastered how to ask for it. I recently spent a day selling West Dorset made hot chorizo served in a roll with a red pepper aioli and a rocket salad. At the stove was a young Spanish man Pablo, who has temporarily fled his country’s economic woes, with not a trace of the hapless ‘Manuel’ about him. The buns were extremely popular but fewer than ten per cent of customers asked for them in a way that made much sense to him. For some reason the standard English pronunciation appears to be “Chor iT So” and no matter how many times we counter offered our “Chor Re Soo”, the stressed “it” was repeated back to us. Such is the power of repetition I too began to succumb, which led to awkward looks from Pablo and repeated Basil Fawlty-ish self administered smacks around the chops to myself. Ultimately it doesn’t really matter how you pronounce something provided you are prepared to give it a go and appreciate it. Unfortunately too much of what passes for chorizo is a bastardised and boring product that doesn’t even resemble the authentic sausage. The British industrially manufactured “Chor iT So” resembles a piece of finely sliced salami dyed a lurid artificial red, served ready sliced clammy and cold from a packet. A different proposition to the naturally brick red alchemy of pork and pimenton that makes proper Spanish-made chorizo an education for the palate. I received my master class in the Spanish way with the pig on an assignment where l was least expecting it. I was in Spain working as a TV journalist on a story about the tribulations of creating a European single currency and needed to find a way to illustrate a point so complex and tedious that I now have no recall whatsoever of what it was l was eager to explain. I decided that what I needed to do was to find a modern food processing plant that would allow me and my team to film a production line. This would form a (clunky) visual metaphor for the point I wanted to make. Somehow I managed to convince a sceptical but charming press officer that it would be in his company’s interest to allow us to spend a day filming at his company’s meat processing plant. He directed us to drive a couple of hours out of Madrid across the hot shimmering plains. We arrived at the gate house shortly before 1pm and were directed to a modern utilitarian building. At the reception we were given the, slightly unwelcome, news that the managing director himself was on hand to offer the BBC a guided tour, but first there would be lunch. Eager to get on with our filming, these were after all only what are called GVs (“general views” or “pretties”), we hoped the formalities could soon be dispensed with and we could get back to earnest interviews with finance ministers. So laden with camera equipment we were shown through a door into an exquisite wood panelled dining room. The room looked like it had been transposed from a castle and the table was laid for lunch. Then, as if by magic, to complete the Mr Benn experience, a well turned out silver haired gentlemen appeared by our side. He clicked his fingers and the first of a dizzying number of plates of ham appeared. On each were five or six precisely cut slices of ham. Every ‘tapas’ of jamon was a subtly different colour ranging from carmine pink to a dark cedar and all tasted startlingly different. With each we were given a potted description of the pigs’ lifestyle and diet as well as a tip as to which vintage of Rioja might best complement it, a glass of which was immediately supplied. As our host listed the different virtues of Jamon de Teruel, how it compared to Jamon de Jabugo or matched the Jamon de Trevellez, it became clear that although each was characterised by a region and it’s climate, for our guide the breed black footed lberian pigs ‘Pata Negra’ and the diet acorn fed ‘bellotta’ was the zenith of ham. I remember desperately telling my brain to store the special characteristic of our feast. But digesting the nuances of a food lecture is surprisingly hard when your tongue is being constantly distracted by the sensational taste and texture of each morsel. The managing director was it turned out a nobleman, a Marqués no less. He was far more interested in educating us in the realities of the glorious variety of ham his country produced; than the potential problem posed by transaction costs that might hamper his company, if the European Union failed to adopt a single currency. With the benefit of hindsight I now see that what he was giving, with an Iberian twist, was a demonstration of De Gaulle’s adage about the impossibility of governing France, a nation which had 246 cheeses. 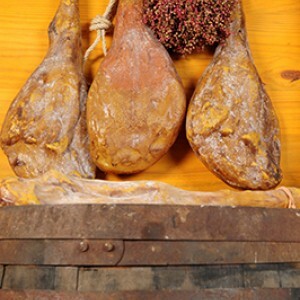 There seemed as many subtly different styles of jamon in Spain (and we tried most that day) so if De Gaulle was right about his people then it is no surprise that the Spanish would subsequently struggle within the straitjacket of the single currency. Eventually we finished our lunch and were ushered full and very drunk through another door to continue our tour. This time we walked straight into a hanger of ham. The “secaderos”. It was a vast space filled with row after row of almost identical pigs’ legs with trotters still attached, calves elegantly turned and thighs like power lifters. Each was gently drying and maturing, a process that could take a year, astonishingly there must have been a hundred thousand of them. The space was probably a kilometre long and the rows extended up to the ceiling. These were some (most, it seemed) of the forty million hams produced a year in Spain. These were from standard pink toed commercial pigs, not the “Iberico” pigs we had been treated with, only 10 per cent of Spanish dry cured ham is from the black footed cousin. Nevertheless the smell was the quintessence of ham. Sweet, savoury, salty and rich. Witnessing the hams in such quantity I suddenly understood how it could be that in every bar in Spain if you look up you see the same sight. The spectre of several sculptural shapes, each hanging stalactite-like but recognisibly organic from the ceiling. I began a befuddled muse on the hams which blend seamlessly into their place at the bar, on how the drinkers below remain oblivious to their presence, perhaps because it seems not to matter if the hams gently perspire in the smoky heat as the patrons are protected from any drips of fat that might otherwise disturb, by small conical cups suspended beneath. Even so did anyone worry about how long they had been there? Do they continue to improve with age? Or are they perhaps purely decorative, the Iberian equivalent of our horse brasses in pubs? My revererie was disturbed by our guide, now wearing a white coat. He took us through another door into the modern meat factory we had been promised. We found that the need for thousands of hams had in turn dictated the creation of a plant to process all the other parts of the pig. The majority of this portion of our magical mystery tour was what we had come expecting. Here we grabbed our general views. We were preparing to pack up when we were asked if we would also like to see the hot dog production line. The ghastly sights we saw here will linger as long as the memory of the exquisite ham. We observed how mechanically recovered meat, fat, skin and bone—the waste from the other processes—was mixed in vast vats with water, cereals and baby doll pink chemicals before being pressurised and extruded into a seemingly endless sausage of sludge. Encased in a membrane this food slurry was injected straight into plastic pockets. Fortunately we weren’t invited to taste this product and I have never been tempted since. Stomachs turning this was the end of our tour. We had passed from the sublime to the food manufacturers’ worst joke against the consumer. lt was now 7pm and we were sober. Our magical guide had departed. Sadly, he left without handing us the customary token that his fictional equivalent always passed to Mr Benn. Despite the disappointing conclusion to our day I still have the memories and have ever since sought out the tastes of that lunch. Even now failing holidays to Spain they are hard to find without a trip to the wonderful Brindisa, a London based importer of the best of anything Spanish. And outside the best restaurants and tapas bars of the capital they remain elusive. Since imitation is the greatest flattery and the British culinary tradition consists of annexing entire cuisines, why have we tolerated ersatz chorizo? Why hasn’t there been a more concerted attempt to produce authentic tasting Spanish style charcuterie? I think this can be attributed in part to the bias of the great popularisers of the Mediterranean diet. Elizabeth David rhapsodised over French and Italian food but gave Spain a swerve and her modern disciples have tended to lean towards the River Cafe and Jamie Oliver for inspiration. Things may now be changing. The closest I have come to the intensity of taste and true texture of the pata negra de bellotta is the ham made at Knepp estate in Sussex. Here a herd of Tamworth pigs roam wild across a 3500 acre estate. Since abandoning intensive management the farm has seen a startling leap in the number of oaks and perhaps it is their acorns that impart a similar savour. I do remember the Marqués telling me it was the oleic acid in acorns, a bitter compound found also in olives that made the difference to the fat of the pigs, adding a complexity and depth like the tannins of fine wines especially when left to age. I rather enjoy one difference; the thought that while the bellotta are acorns from scrubby holm oaks, at Knepp the acorns fall from fine English oaks. The parlous state of the Spanish economy may encourage you to support their exports. But now we are fortunate that a number of small producers in the West country are embracing real Spanish practices with pork, so do give them a go. I am convinced that the lifestyle and diet of animals are the deciding factors in delivering the best eating experience and this is something you can trace if you buy locally. Standing out in Dorset is Rob Lemmey at Liberty Farm, who is producing an authentic fresh chorizo that stands comparison with the finest from Spain. His pigs are organic and free range and probably speak with an English accent (even if his recipe is direct from Spain). I do urge you to taste some if you get the chance, you won’t be buying the supermarket version again but please do try not confuse Pablo by stressing the wrong syllables when you order it.